Las Vegas, Nev., Jan. 17, 2019 - The Howard Hughes Corporation®, developer of the Summerlin® master planned community and Las Vegas Ballpark®, today announced a multi-year partnership designating Cox Business as the Technology Sponsor of the new 10,000-capacity stadium. 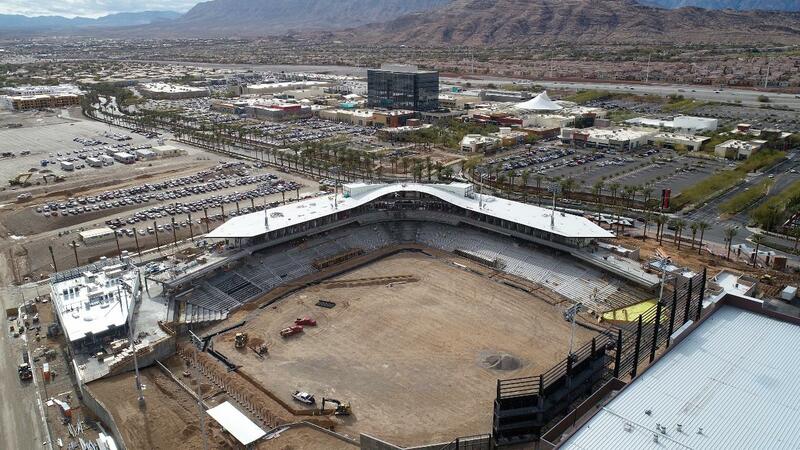 Currently under construction at Downtown Summerlin®, Las Vegas Ballpark is the future home of the Las Vegas Aviators®, the city's professional Triple-A baseball team of the Pacific Coast League (PCL) and affiliate of the Oakland Athletics. The partnership features Cox's product integration throughout Las Vegas Ballpark, as well as several promotional, marketing, fan activation and community relations initiatives. "We value our relationship with the Las Vegas Convention and Visitors Authority and The Howard Hughes Corporation, so we're understandably very excited about this newest affiliation as Technology Sponsor at Las Vegas Ballpark," said Derrick Hill, vice president, Cox Business Las Vegas. "As sports fans, we look forward to getting behind the Aviators during the team's first season at its new stadium and helping to create a premier fan experience at the city's new, first-class baseball venue." "Cox Business' reputation as an industry-leading provider of technology products and solutions is well-known and well-deserved," said Don Logan, president and chief operations officer of the Las Vegas Aviators. "Through this partnership, Cox Business will provide a broad range of services and products that will not only deliver the best possible stadium experience for fans, but also enhance the organization's technological capabilities." Relying in part on its Hospitality Network division to implement the advanced technologies at the new baseball stadium, Cox Business has years' worth of large-scale technology deployments at arenas, convention areas and meeting facilities. The company has successfully designed and deployed technology services resembling those at Las Vegas Ballpark for sports venues, serving as Exclusive Technology Integration/Telecommunications Services Provider at T-Mobile Arena in Las Vegas, Nev., home of the Vegas Golden Knights; as Exclusive Marketing and Technology Provider at State Farm Stadium in Glendale, Ariz., home of the Arizona Cardinals; as Exclusive Technology provider at Dunkin' Donuts Center in Providence, R.I., home of the Providence Bruins; and as the Exclusive Telecommunications Sponsor at Admiral Fetterman Field in Pensacola, Fla., home of the Blue Wahoos.